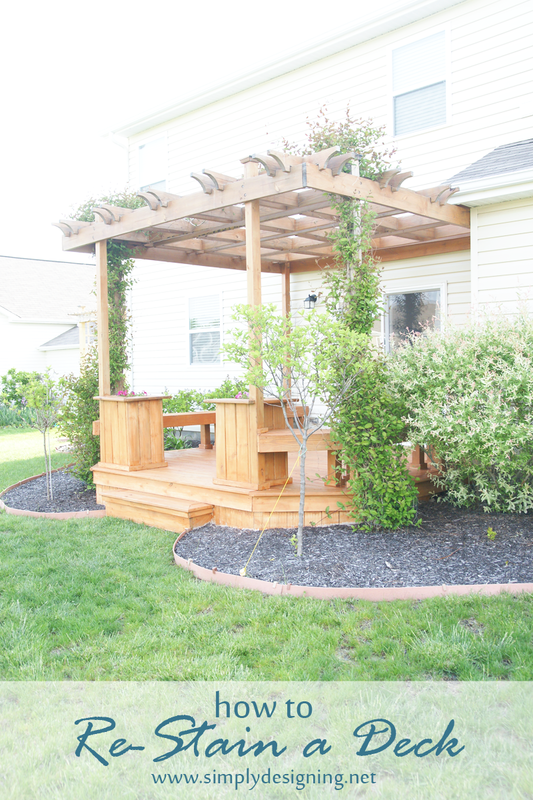 Last year we stained our deck and pergola. Unfortunately, like many of you, our summer was really hot and our winter was particularly harsh. As a result, we had a few areas that chipped. 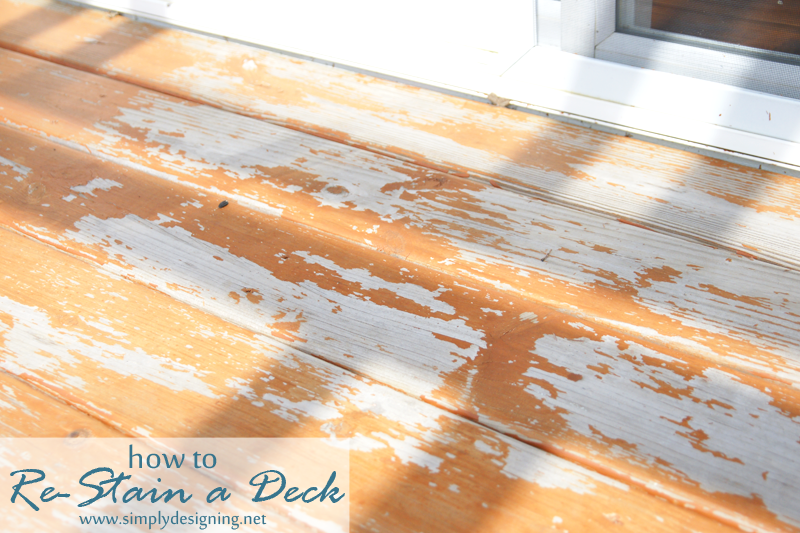 So we decided to take the time this spring to re-stain our deck! 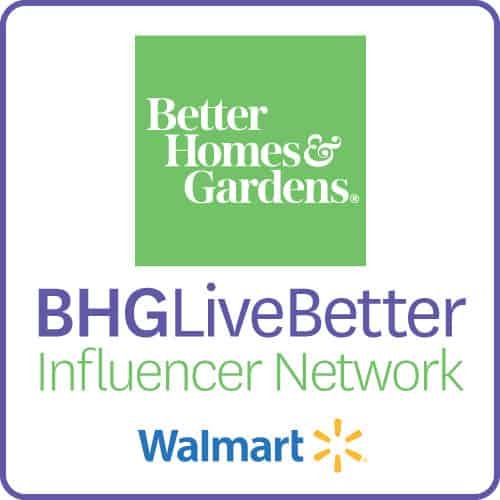 Plus I get to offer you a really fun Deck Staining Package Giveaway from HomeRight! Woot woot! 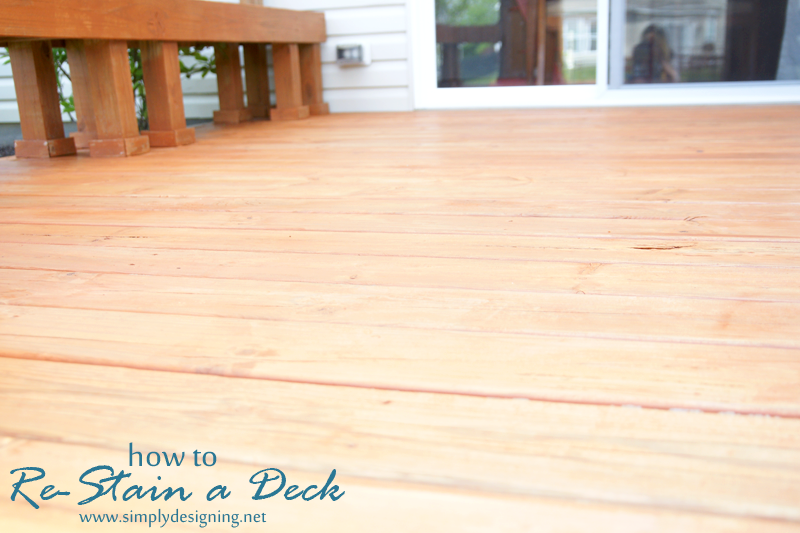 If you are looking to stain your deck for the first time, check out my blog post HERE showing how to stain your deck. 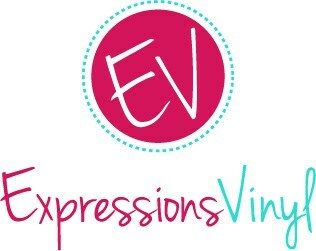 But if yours needs to be re-done like ours, keep reading to see how we went from sad to fab! 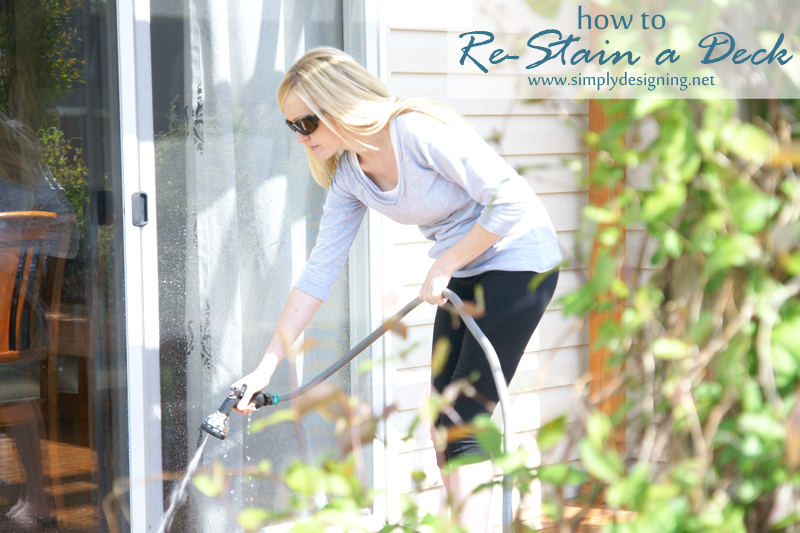 First you will used your Stripped to help strip and loosen your stain. 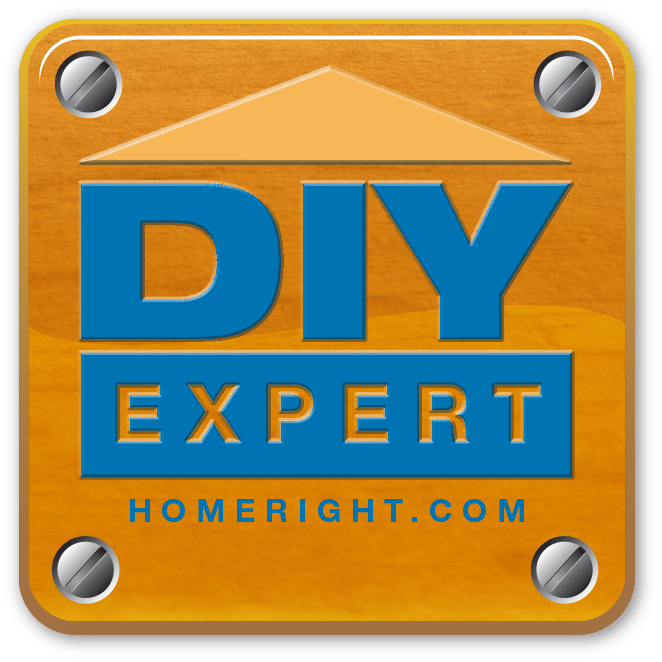 We used the HomeRight Deck Washer to help with this step! 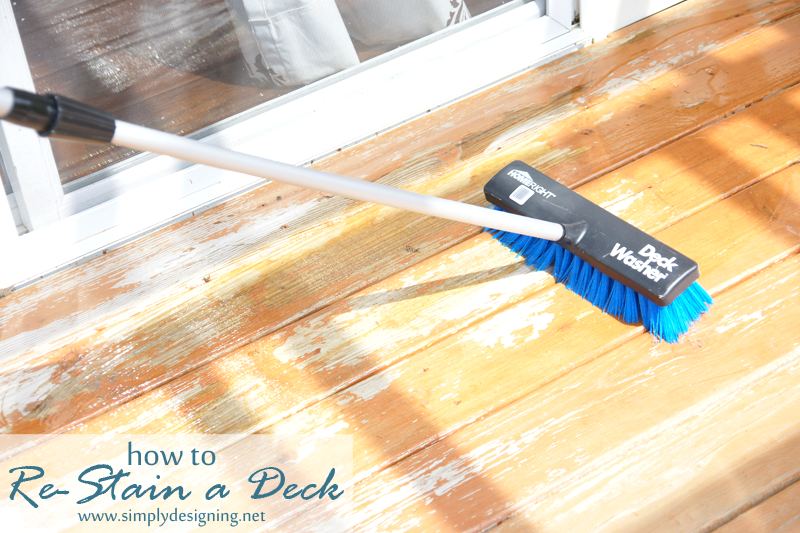 The bristles are perfect for giving the deck a good scrub and for applying the stripper to the deck. You will let it soak for about 15 minutes (follow the directions) and then you will wash the deck clean. The Deck Washer is also amazing for washing and prepping your deck to receive stain the first time! 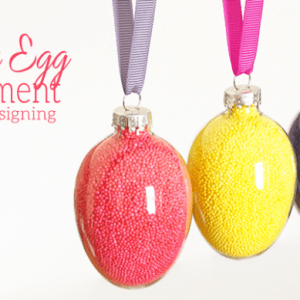 You can read all about how we used it for that HERE. When you are washing your deck, you can use your hose or a power sprayer. But if you use a power sprayer you do not want to turn the hose up all the way. Your HomeRight Deck Washer can also be used for this step as well. 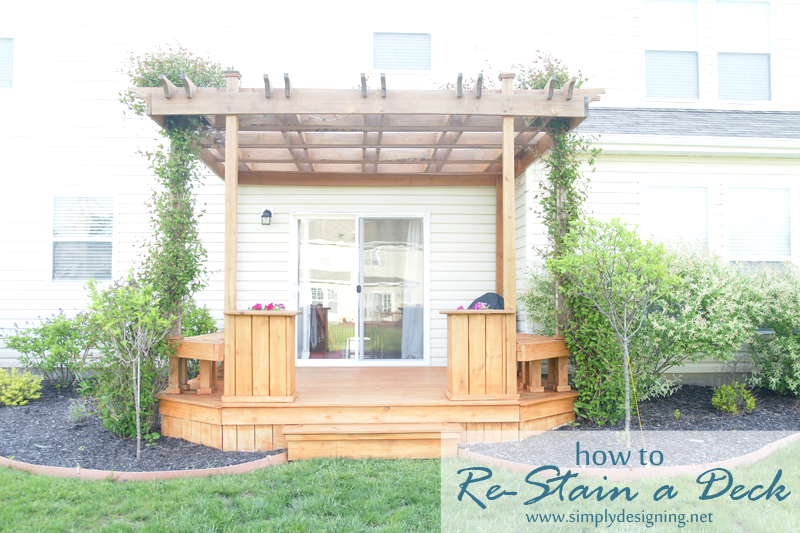 This step should remove all of your stain from your deck. Then you will spray or scrub your brightener on, let it sit according to directions and then rinse it off. At this point you will need to let your deck dry completely for about 48 hours before you can proceed. 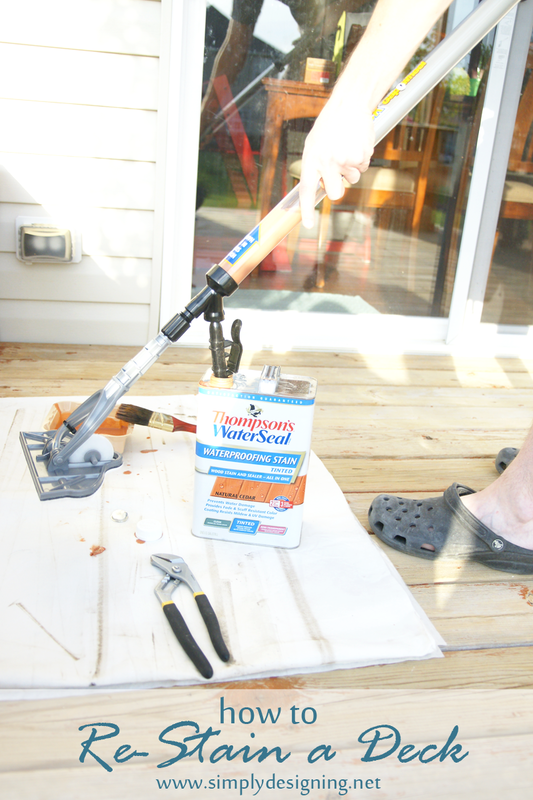 We then applied our stain using the HomeRight Deck Pro StainStick with GapWheel. And can I tell you, this thing is AMAZING! First of all, the StainStick is able to draw and hold stain directly into the stick and by gently pushing the handle, your stain will dispense into your applicator. And the GapWheel is simple amazing! The GapWheel fits perfectly in between the deck boards to apply stain on top and in between your deck boards at the same time! 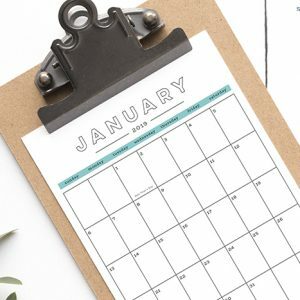 This amazing tool saves tons of time and back breaking labor! 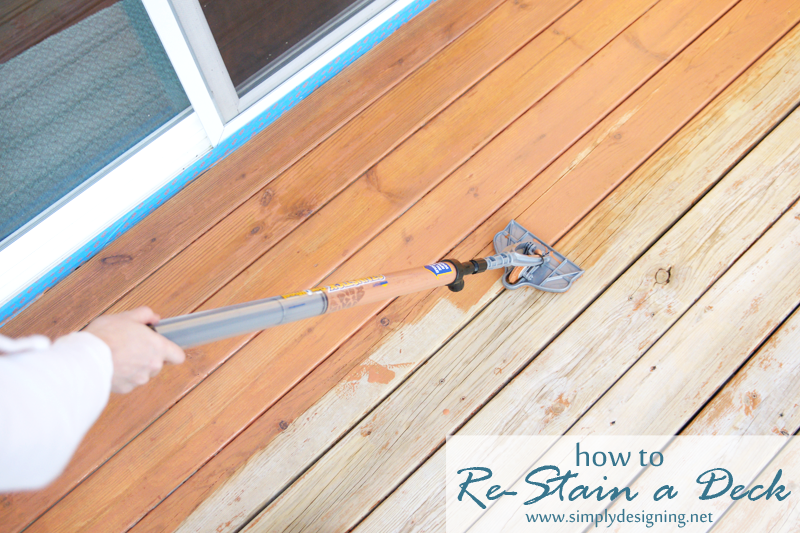 It truly makes applying stain to a deck SIMPLE and QUICK! It is amazing! 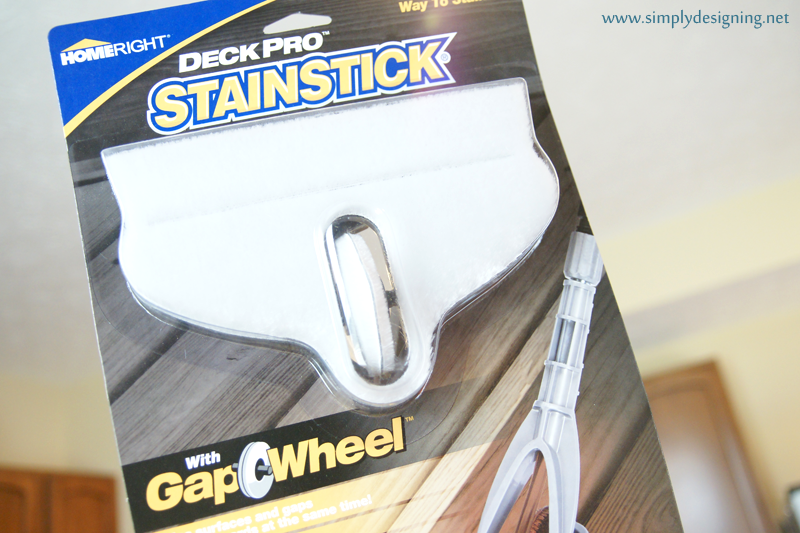 I will never ever ever stain a deck without our HomeRight DeckPro StainStick with Gap Wheel again! See how easily that applies!? It went on effortlessly and in less then an hour our entire deck was re-stained and beautiful again! This is seriously one of my favorite tools! And we LOVE how our deck turned out! 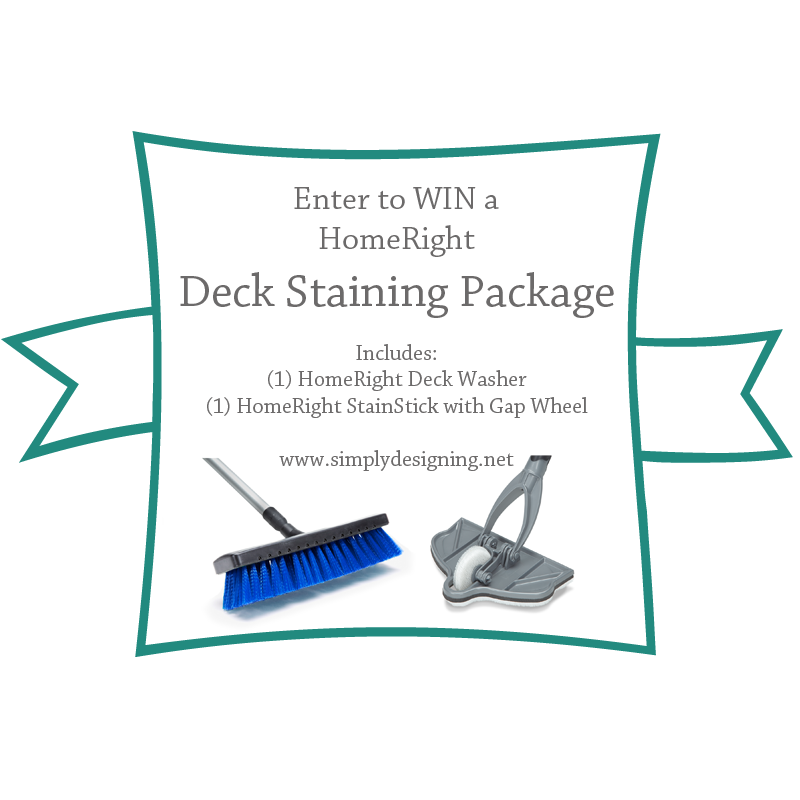 And now I am thrilled to be able to GIVE AWAY a fab Deck Staining Kit including (1) HomeRight Deck Washer and (1) HomeRight Deck Pro StainStick with Gap Wheel! Your deck looks great! Thanks for all the great tips! Your deck looks like new! I told my in-laws about HomeRight and how they are so much easier to use. This would be a great tool for their huge deck.